By joining Team Healthy Resolve, you are backed by all of us! You will be added to a private Facebook group where you will receive updates, information, tips and support from all of the others on our team. You will also have the opportunity to work through an apprenticeship program with me to help get you started on the right foot! 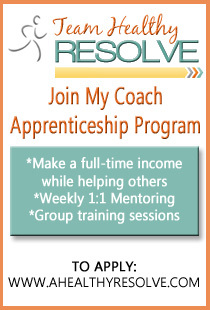 There are also new coach trainings happening every month. You will not have to do this alone! If you are ready to join this amazing group, change the lives of others and build a full-time income, fill out the application below. You do not need to be a fitness professional or at your ideal weight/fitness level. You just need to be passionate about helping others and willing to give this business your all! Thank you!